Man say if you wanna shoot nails, this here the Cadillac, man. He mean Lexus, but he ain’t know it. Having recently re-watched the fourth season of the best television show in history, I need now to amend my assessment two years ago that the Göttingen Septuagint is the Cadillac of Septuagint editions. It’s the Lexus of the LXX. 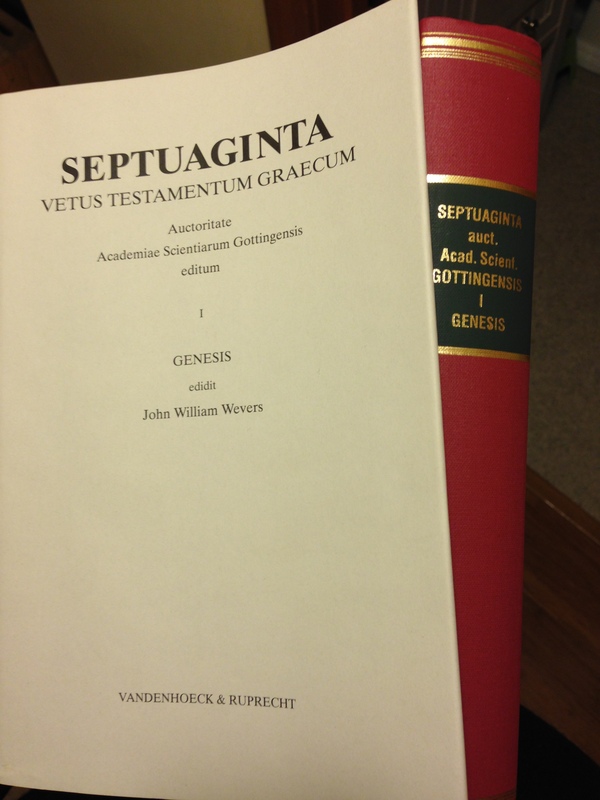 Vandenhoeck & Ruprecht in Göttingen, Germany publishes the Göttingen Septuagint, more formally known as Septuaginta: Vetus Testamentum Graecum Auctoritate Academiae Scientiarum Gottingensis editum. The series of critical texts with apparatus spans more than 20 volumes and covers some 40 biblical books (counting the minor prophets as 12), with more continuing to appear. But, as I remarked two years ago when I confused Cadillacs and Lexuses, the Göttingen Septuagint is not for the faint of heart, or for the reader who is unwilling to put some serious work in to understanding the layout of the edition and its critical apparatuses. Enter John William Wevers. If Göttingen is the Lexus of LXX editions, Wevers is its chief mechanic. His Notes on the Greek texts of the Pentateuch–though provisional in nature, Wevers intimated–remain some of the best resources for carefully studying the Septuagint. And his Text Histories on those same books (now free online, thanks to the Göttingen Septuaginta-Unternehmen) guide the reader through the transmission of the Greek text in its various manuscripts. Better yet, before his passing Wevers translated much of his own Göttingen-Pentateuch introductions from German into English. That enduring gift can be found here. Published in 1974, Wevers’s Genesis includes a 70+-page introduction, Wevers’s reconstructed Greek text of Genesis, and two critical apparatuses at the bottom of each page that highlight readings from various manuscripts. Wevers’s Genesis introduction is here in English. Miles Van Pelt has made available his own two-page summary of sigla and abbreviations (here as PDF). So equipped, the reader (whether she or he knows German or not) is ready to work through the Greek text itself. Instead of using a text based on an actual manuscript (as BHS, based on the Leningrad Codex, does), the Göttingen Septuagint utilizes a reconstructed text based on a thorough examination of evidence from manuscripts and translations. Because it is an editio maior and not an editio minor like Rahlfs, any page can have just a few lines of actual biblical text, with the rest being taken up by the apparatuses. Here’s a sample page from Genesis 1 (image used by permission). Note the #s 1-4 that I’ve added to highlight the different parts of a page. With verse references in both the margin and in the body of the text, the top portion of each page of the Göttingen Septuagint is the editorially reconstructed text of each biblical book. In the page from Genesis 1 above, you’ll notice that the text includes punctuation, accents, and breathing marks. Since it must be presupposed that this text will be standard for a long time, the stance taken by the editor over against the critical text was intentionally conservative. In general conjectures were avoided, even though it might be expected that future recognition would possibly confirm such conjectures. The Kopfleiste comes just below the text and above the apparatuses in Genesis. Wevers notes it as a list of all manuscripts and versions used, listed in the order that they appear in the apparatus on that page. A fragmentary textual witness is enclosed in parenthesis. The critical apparatuses are where the user of Göttingen can see other readings as they compare with the critically reconstructed text. Because the Göttingen editions are critical/eclectic texts, no single manuscript will match the text of the Göttingen Septuagint. In view of the fact that the materials presented in the second apparatus [are] not at least in theory a collection of variants within the LXX tradition, but rather one such of readings from other traditions, especially from the “three”, which have influenced the LXX tradition, these readings are given in full. “The three,” sometimes referred to in Greek as οι γ’, are the texts of Aquila, Symmachus and Theodotion. In other words–there is virtually no stone unturned here in the quest to reconstruct a Greek text of Genesis. 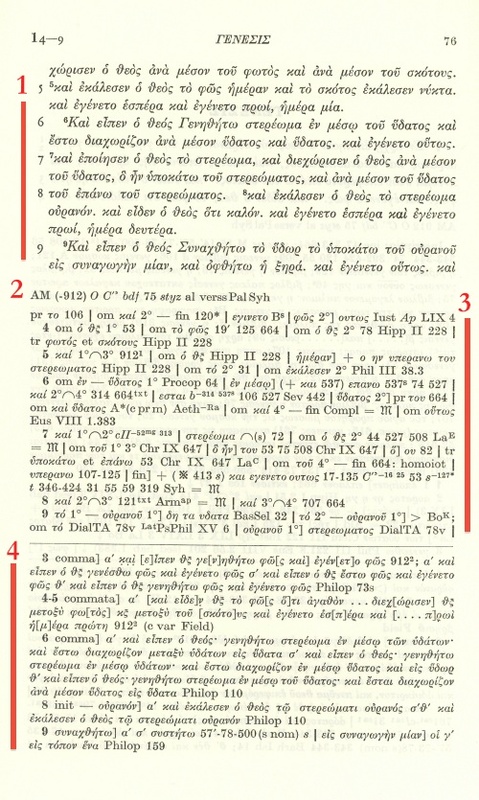 Serious work in Septuagint studies uses the Göttingen text, where available, as a base. Wevers’s scholarship and care for the text is clear as one makes her or his way through the Genesis volume. It’s the starting place for studying the Greek text of Genesis. You can find the volume here at V & R’s site, and here at Amazon. ISD distributes the book, as well, and carries it here. Many thanks to V & R for the review copy of this fine work, given to me with no expectation as to the content of my review. Find more V & R blog posts here.